Pump One. Jacuzzi #6500-343 230V, 2.5HP, 2 Speed, 48 frame pump and motor combination fits all J-280 built until August 2010. Pump Two. Jacuzzi #6500-341 230V, 2.5HP, 1 Speed, 48 frame pump and motor combination fits all J-280 built until August 2010. 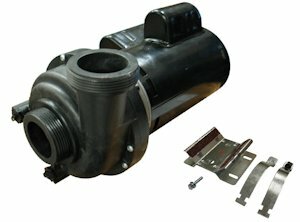 These are the new universal rotation bracketless motors with universal mounting bracket, so they will fit regardless of your existing pump orientation..
Pump One. Jacuzzi #6500-367 230V, 2.5HP, 2 Speed, 56 frame pump and motor combination. Pump Two. Jacuzzi #6500-352, 230V, 2.5HP 1 Speed, 56 frame pump and motor combination. Pump Two. Jacuzzi #6500-352 230V, 2.5HP, 2 Speed, 56 frame pump and motor combination. All Pumps are complete with Universal Mounting Bracket and 3/8" Barbed Bleed Fitting.